As everyone in range of youtube now knows, President Elect Obama* is committed to spending what it takes to revive the American economy. A very welcome development, after months of spending what it takes to transfer risk from the rich to the rest of us. But still, such ambition does beg a question: stimulate what? My basic approach to this question is the obvious one: pouring money into an economy works to stimulate activity, but it works best if you spend the money on things that have the capacity to evoke more economic activity in their turn. So if you really want to promote long term economic growth from within a depression/recession, you have to buy some tickets in the game. ** Or, to put it more formally, you have to use the power of government spending to build capital that will in turn prove to be economically useful over a much longer time-frame than the immediate quarter or even year in which the Treasury prints the necessary cash (debt) to round out all those zeroes being talked about in Washington right now. From where I sit (staring out over the MIT campus), that means spending on projects rich in science and technology — or at least ones that foster the uses of what science and technology produce: ideas and physical things that contribute to human well-being. So what I’d like to do here is to begin a discussion, if possible, of what we should do with the stimulus process that could be informed by what science and engineering approaches suggest are the best long term investments in the country’s economy. For one, there is just a broad based investment in the American research establishment. It makes little sense to try and pick winners in the next great idea competition; the trick is to fund as many of the best people as you can find and let them come up with ideas that enhance human well-being (and thus produce a lot of economic activity in their wake). That’s the thinking behind this post (and this follow-up) in which I made a pitch for a major investment in human capital: paying for the education and early research careers of a much larger pool of young scientists and engineers than we now support. It’s a good idea in just about any economic climate, and would have some stimulus effect — but in all honesty it falls between the relief and stimulus poles of any future plan. The need to support young scientists is becoming acute as universities both public and private confront the joys of endowments and state/federal budgets that are under the pressures we all know. Also, though we will see economic and cultural benefits from the discoveries to be thus enabled, the time frame is a little loose. For a more concrete idea, try this: early action on one thing the Obama team has already said it wants: a new “smart” power grid. The new grid is a prime example of the sort of stimulus I think we need because, first, it will pay for itself over a reasonable amortization period, given the potential improvement over current losses in the power distribution system. But more than that, the new grid is crucial because it enables much else that we want to do for economic, environmental, and national security reasons. We need a dramatically enhanced power transmission system to handle the particular demands on the transport of electricity from the proposed increase in renewable generating capacity in the wind/solar belts of the largely underpopulated middle and southwestern desert portions of the country. Those places are a long way away from most of the major population centers that will use the power thus generated, which means we need as efficient a grid as possible. But the issue is more pressing than that. An industry study [link to PDF] suggests that wind/solar power being less controllable and more irregular than conventional plants, puts unusual demands on a grid. The one we have now won’t hack it, and it will prove to be a significant design and construction plan to get one in place that can. See this NYTimes piece for a first cut through the reasons why. All of which means that funding now for a new grid meets two goals: immediate classical Keynsian stimulus, with jobs created right here right now, and long term capital investment of the sort that only government can undertake. Think of this as 21st century analogue to the construction of the interstate highway system, without many of the ecological side effects. A win-win in other words. (FWIW, as a more direct heir to the road building of both the thirties and the fifties, I’d love to see an investment in high speed passenger rail that would eliminate the need for air travel on any journey of less than 300 or so miles around the major hubs — the same basic arguments apply, but because the benefits are felt most immediately in regions rather than nationwide, a harder sell). So over to you, dear readers: what else should our better part of trillion bucks of new government capital spending buy? *I still love writing tht. **The reference is to this old joke. 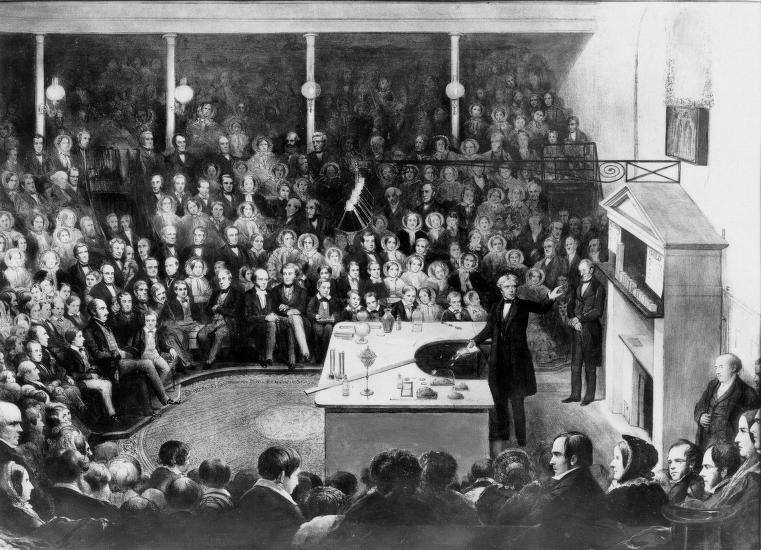 Image: Alexander Blaikle, “Michael Faraday*** delivering a Christmas Lecture at the Royal Institution,” c. 1856.